2 x 250g succulent rib eye steaks. All of our beef is free range and British. Each week we source top grade free range British Beef for our customers from suppliers at London’s Smithfield Market and directly from farms in the English countryside of Sussex, Kent and Oxfordshire. We use breeds such as Limousin, Lincoln Red, Simmental, Angus & some cross breeds all heralded for their great qualities, hardiness and yields. The steaks are prepared and vacuum packed in our shop. A bottle of Zuccardi Estate Malbec. 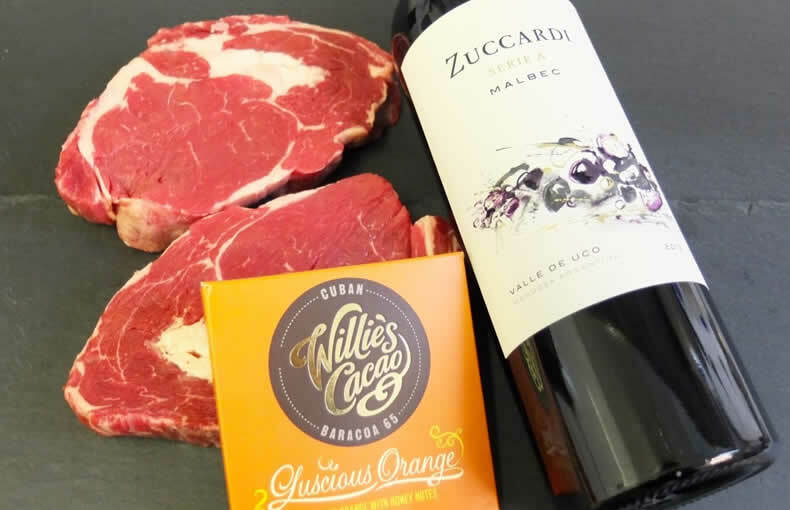 We have selected this wine as there is no better match for these steaks than a great Argentinean Malbec. Blackberries, blackcurrants, raspberries & cherries with spices & minerals. A 50g bar of Willies Cuban chocolate. Luscious orange with honey notes. A delightfully bitter/sweet end to your meal.